Croft Cottage Self-cateringCroft Cottage was built in the 18th century but with modern touches including underfloor heating and a woodburner it is very cosy in the colder evenings. 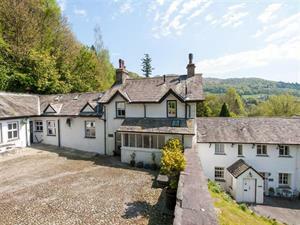 Just a short distance from Ambleside it has superb views towards Lake Windermere and Wansfell and also access to River Brathay if you have a canoe with you! A lovely holiday home sleeping 3 people. NB: Please note the driveway to this property is steep but short, with a couple of tight bends making it possibly unsuitable for low suspension vehicles. NB Also please note ,as the driveway to this property is steep though short, it is possibly unsuitable for the elderly or less mobile if walking up and down especially in cooler and wet weather. A beautiful 18th Century cottage packed with character and charm, just a short stroll from neighbouring Ambleside. Croft Cottage offers weekly bookings starting on Friday.